If you’re currently going through the joyful process of obtaining a home loan, you may have been asked to furnish a “letter of explanation” or LOE to provide a little more color to what the underwriter might feel is a complicated matter. You can think of the mortgage underwriter as a home loan sleuth, one hired to uncover anything abnormal that may show up in your loan file as documentation is submitted. Sure, the required paperwork might all be there, and your credit score and DTI ratio might be spot on, but it is the underwriter’s job to read between the lines. Otherwise, mortgage applications truly could be fed through automated underwriting systems and that would be the end of it. We wouldn’t need human beings anymore. This isn’t the case, at least not yet, so expect your mortgage application to be scrutinized, and be prepared to “explain yourself” if anything that the underwriter feels needs explaining comes up. Definitely don’t argue with the underwriter or be defiant, that’s never a very good strategy. Ultimately, the quicker you can get them the answers they need, the faster you can get your home loan closed and move on with your life. Why a Letter of Explanation Might Be Needed? There are lots of situations where a letter of explanation might be required, too many to name really. And probably new ones being generated daily. Additionally, the need for an LOE will vary by mortgage lender. Not all of them will require one depending on the situation at hand. Ultimately, some lenders and underwriters will be more stringent and/or cautious than others. That being said, some of the more common ones tend to do with assets aka money, and where it came from. For example, if you provided bank statements to satisfy one of your loan conditions, the underwriter might flag some of the transactions or deposits upon review. Perhaps there’s a deposit for $10,000 in the account, which doesn’t quite line-up with what you make in the way of salary. It seems a little out of place, even if it’s entirely legit. The underwriter may ask that you explain that deposit to ensure it’s kosher, and not from an ineligible source. Let’s say that money came from one of your other accounts, and you simply transferred the money between accounts. You would provide an LOE to the underwriter explaining this. But that wouldn’t be the end of the story. 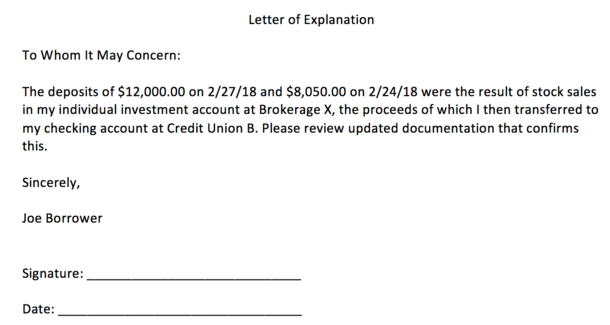 If your LOE included details of another bank account, they’d surely want statements for that bank account as well to review the activity to make sure everything adds up. Sometimes, if you’re lucky, you might even be asked to come up with another letter of explanation due to contents in your previous LOE. In effect, an LOE for an LOE. As you can see, things can get really murky in hurry, so it’s best to keep things really tidy before applying for a mortgage loan. 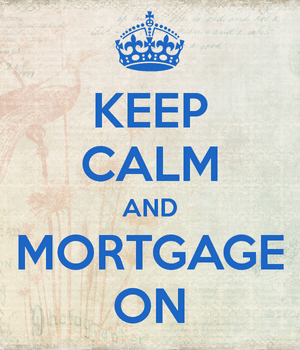 Rarely are mortgage underwriters completely satisfied with everything that is presented to them. And the more you put in the front of them, the more chances they have to ask for, well, more. The screenshot above is a sample LOE template I created in a matter of minutes if you’re wondering how to write a letter of explanation. The good news is it’s super easy to create one. It’s basically just a Word document (or comparable program) with a little heading and then a brief paragraph or two to provide clarity, followed by your signature and the date it was written. There aren’t any set formatting guidelines for an LOE, so you can put the date at the top or the bottom, and leave out the salutation if you want. It doesn’t really matter too much as long as the key details are there. You can put “Letter of Explanation” or “Explanation Letter” at the very top, followed by a brief description of the issue at hand, then your name/signature/date. It really doesn’t take much effort to create one. That’s the easy part. The hard part might be providing supporting documentation, or making your case if don’t have a readily available explanation. What you write in those couple paragraphs is very important, so don’t rush the core message you’re trying to convey. In short, whatever you’re explaining has to make sense, and more importantly, put the underwriter at ease. They need to feel comfortable approving your loan, and whatever called for the LOE to begin with made them apprehensive. It’s certainly not the end of the world, and often just hearing in your own words that X happened because of Y is good enough, with that supporting documentation to prove it. Taking your word for it isn’t generally acceptable. Either way, don’t be afraid to ask the loan officer or mortgage broker exactly what they’re wanting to hear, or how you should format the letter. If you have questions or are uncertain, ask before you submit documents that could get you in even more trouble. Your best move might be to get all your ducks in a row long before applying for a mortgage. If you need to move some money around, it could be prudent to make those transfers 60+ days prior to the loan application. Mortgage lenders typically only ask for your last two monthly bank statements, so activity that occurred prior shouldn’t be visible. Any financial activity that takes place in the couple months prior to application could just complicate matters, and require more paperwork. And with that, scrutiny. If your accounts are relatively untouched and nothing unusual is present, ideally you can skate right through without additional conditions. Same goes for opening new accounts – if you don’t have to, don’t do it. It just makes life more complicated. If you’re thinking about changing jobs, maybe wait. Anything you think might sound fishy or complicated might be best to avoid, for now. Or at least until that loan funds! At the end of the day, LOEs aren’t really that hard to furnish or complete, but they can lead to bigger problems if you don’t have good answers. As noted, do your best to play ball and make nice with everyone to avoid unnecessary drama. Lastly, if you are asked to provide a letter of explanation and aren’t sure why, speak to your mortgage broker or loan officer directly. I often get emails and comments about why one is being requested. Instead of asking me, it’s probably a better idea to ask your broker or representative of the bank to get to the bottom of it as quickly as possible.